Description: An early woodcut of Jerusalem taken from the Nuremburg Chronicle and detailing the cities historical devastations. Description: Attractive woodcut view of 16th century Jerusalem. Taken from the German edition of the 'Cosmography'. Coloured. Description: Early woodcut illustration of the city with a descriptive text panel on the lower margin. Title: : Hierosolyma Vrbs Sancta, Ivdeae, Totivsqve Orientis Longe Clarissima, Qva Amplitvdine Ac Magnificentia Hoc Nostro Aevo Conspicva Est. Description: Early bird's eye view of Jerusalem published within the second volume of 'Civitates Orbis Terrarum'. Original colour. Description: Early bird's-eye view of Jerusalem with an inset of Moses receiving the Tablets. Published in the seminal, 'Civitates orbis terrarum'. Superb original colour. 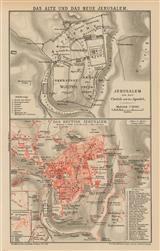 Description: Famed two-sheet map of Jerusalem during the Biblical period. The rarest of the three maps produced by Braun and Hogenberg. Original hand-colour. Description: Bird's-eye view of ancient Jerusalem, highlighting biblical landmarks. 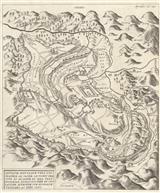 Description: Detailed bird's eye view plan of Jerusalem with accompanying key. Description: An exquisite plan of Jerusalem with a large elevation of the Temple of Solomon along the upper border. Beautifully engraved figures of King Solomon and the High Priest flank the map. Description: Bird's eye view of ancient Jerusalem based on the description by Christian van Andrichom. With index to important buildings below. German and Latin text. Original colour. 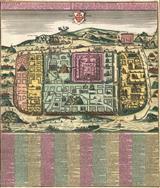 Description: City Plan of ancient Jerusalem with ornate border. Important sites including Pilates Palace and the citadel engraved in detail. Coloured. Description: Interesting map of Jerusalem from the late 19th century with an overlay of the geography of the city from the classical period in red. Printed colour. Description: Two plans one one sheet depicting the old and the new city of Jerusalem . Printed colour. 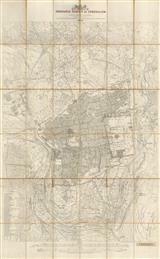 Description: City plan of Jerusalem highlighting the ancient sites of the city, based on the survey conducted by the Ordnance Survey of Great Britain. Printed colour.